I’m excited to welcome Kathleen DiChiara to the podcast. We’re digging into our food supply and the impact on fertility. As a nutrition educator and researcher, Kathleen has dedicated her work to increasing the public’s knowledge about the connection between nutrition and patterns of disease. Her practices aim to address the health of the whole by taking into account the physiology and biochemistry of the human body and our connection to our nature. 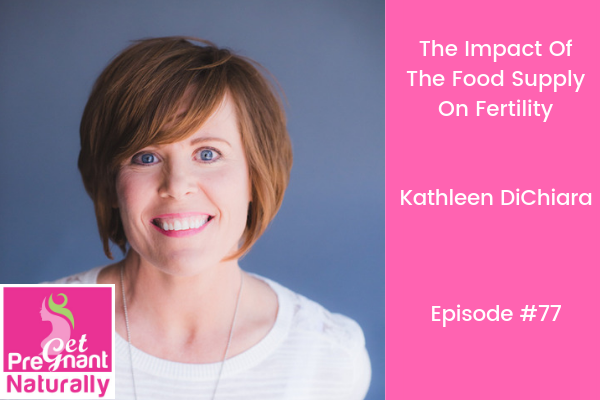 Kathleen is a Functional Nutrition Practitioner, BioIndividual Nutrition Practitioner, Certified Integrative Health & Nutrition Coach and Author of the bestselling book, The Hidden Connection, and will publish her next book, Resilience, with Hay House in early 2020. Her incredible story of recovery and hope is featured in the documentary film Secret Ingredients. Kathleen is the President and Founder of Rhode to Health, Inc, a corporation dedicated to teaching and empowering others to embrace the self-care model to dig us out of the healthcare crisis. She is the Founder of a grassroots organization called Nourished2Learn™ that bridges the gap between the foundation of nutrition and academic performance by teaching children, parents and administrators the importance of nutrition in public schools. She also serves as a Board member on the Rhode Island Department of Health’s, Board of Chiropractic Examiners, as well as, the Nutrition Advisor on the Board of the Bionutrient Food Association. What we place on our fork does matter for our health and fertility. To say there is no connection…does NOT make sense. We are in the middle of a HUGE food experiment. Our food supply is being sprayed with pesticides and herbicides. If the workers need to wear personal protective gear (such as respirators and hazmat suits), why do we think it is okay to eat the food? The food supply is impacting our fertility. We are racing to the fertility clinic, without looking at the underlying reason as to WHY we are struggling. 1) What the research tells us about the link between our food supply and chronic health conditions – such as infertility. 3) Why optimizing digestion is KEY for hormone balance (and the first place we start with our 1:1 clients). Plus we talk about the impact of stress on our ability to conceive. 4) When we’ve made all the dietary changes (gluten/dairy free – non GMO, organic) – what if we still are not pregnant – why focusing on the health of the microbiome is important.